Recent years have seen a host of games queuing up to imitate Grand Theft Auto’s open-world cityscapes, while Hollywood’s renewed interest in superhero licences has seen an almost equal number of its own derivatives. inFAMOUS amounts to a uniquely effective mixture of these cultural fixations. But unlike the majority of such titles, expertly-tailored superpowers genuinely make the player feel, erm, super, and the smart mission design in-turn serves to invigorate the familiar crime-ridden metropolis in which it’s set. You play as delivery man Cole MacGrath, who’s imbued with electrical powers after a massive explosion wipes out several blocks of his native Empire City. Riots, food shortages and general discontent form the backdrop to an engaging story that sees Cole pursuing the mysterious Ray Sphere; an object powerful enough to destroy the entire city should it fall into the hands of hammy villain Kessler. And as the title suggests, there’s a highly appetising ‘be good or be naughty’ element underpinning things. The moral system isn’t simply an after-thought though; there are many ways to go about building a saintly reputation or becoming everyone’s favourite source of discontent. If you want to make like a traditional superhero, Cole can heal injured pedestrians, bind fallen enemies, assist police in the riots and generally be a do-gooder when asked for assistance. His appearance will alter to appear more heroic and pedestrians will help out in fights, but your actions will also allow him to purchase upgrades that reflect his hero status; such as electrical grenades that automatically bind enemies on impact, or a lightning bolt that rewards accurate shooting with a healing effect on Cole. But suppose you’re bored of keeping the peace, and have had enough of being called ‘Light-Bulb Man’ by yuppies intent on greeting their hero with a camera phone? Being evil has its perks too; aside from changing the story development (a little), Cole can leech energy from injured foes and not have to worry about wreaking indiscriminate destruction in the more open streets fire-fights. Ironically, being an anti-hero makes things easier, as Cole’s attacks become noticeably more venomous; for example, shock grenades at their most powerful cluster into seven explosive charges, whilst the shockwave causes cars caught up in the blast to explode. The only downside is that the pedestrians swap phones for stones, and generally aim them in your direction, alongside the obligatory moral advice. But you’re an anti-hero, so you can handle it. There are some real grandstanding missions; most notably protecting a train propelled by Cole’s electricity and scaling a gigantic rubbish tip that stretches up into the clouds. There’s many more besides and overall, the game makes full use of its locales, adding a healthy splash of variety to your escapades. There are missions that see you destroying machine-gun heavy buses; getting the trains on each of the three island’s running again; finding hidden packages with picture-based hints; carrying out hostage rescues and performing assassinations to name but a few. The ability to climb buildings isn’t anything new, but it’s put to evocative use in this modern setting. Certain missions have you disabling surveillance devices from the sides of structures, whilst others have Cole navigating half-dilapidated prison exteriors or hoping across the rooftops in pursuit of helicopters. This, along with the ability to ride electrical wires and glide between expanses with stasis thrusters means there’s a lot more to the platforming side of inFAMOUS than your average sandbox title. And this isn’t the only area in which the game excels, as the action is also first-rate. Imagine Uncharted’s combat – sharp controls, intuitive aiming and a simple, effective cover mechanism – then add Cole’s awesomely destructive, satisfying powers and you’ve got the makings of some really cool fire-fights. The enemies don’t hold back; they’re unerringly accurate at sniping Cole if you take to the rooftops; there’s the danger of being ambushed in the alleyways and the main streets are often guarded with machine-gun emplacements, meaning a tactical approach is often a necessity. Going on the defensive tends to provoke foes into grenading or circling your position, so there’s a fine line between picking-off baddies individually, or going after several of them in order to take the sting out of their attack. Either way, there’s nothing quite like taking down five-in-one with a well-placed grenade, or blowing up a petrol station along with those using it as cover. There’s very little to grumble about gameplay-wise. A trio of espionage missions on the first island feel a little out of place, but fortunately the developer hasn’t seen fit to pursue them as the game progresses. Structurally the game is superb, and really the only small gripe is that, if you die outside of a mission, the game has very few respawn spots, and it often dumps you a long way from where you were last exploring. inFAMOUS suffers from just a hint of slow-down here and there, and travelling up the higher buildings reveals a bit of pop-up. For the most part though, the physics showcased in the carnage wrought by Cole’s more tasty powers are something to behold. Most importantly, it runs solidly and there are no qualms with either the shooting or the platforming. Voice-acting is of an acceptable standard (something of an achievement in itself within the genre); Cole is suitably gruff and cool, and though his friend Zeke’s jovial attitude is ill-suited to the later scenes and main bad-guy Kessler has swiped one too many lines from the movie clichés handbook to be taken too seriously, it doesn’t compromise what is a rather good narrative, even if the attempt at a killer plot-twist near the end proves rather predictable. Still, when you’re kicking goons off skyscrapers, firing cars at unsuspecting lookout towers and electrocuting anyone silly enough to be standing in water, you be far too busy having riotous fun. There are forty main missions, as well as 15 instances in which you can opt for a choice between a good or evil mission, and a great many more besides that aren’t affected by karma. You’ll finish it within a week, but a second run’s a given as there’s a raft of new abilities and scenarios to tackle, depending on how you go about your business. 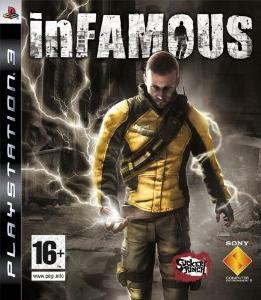 inFAMOUS ranks among the very best sandbox games – and indeed games – of the seventh generation. In a time where such titles seem intent on hammering the player with menial tasks and dull fetch quests, Sucker Punch have enriched the play aspect. It revels in a host of scenarios that really play to Cole’s powers, meaning both the excellent shooting and immersive adventuring elements are never made to feel incidental. It’s action-packed, explosive and wonderfully-crafted.